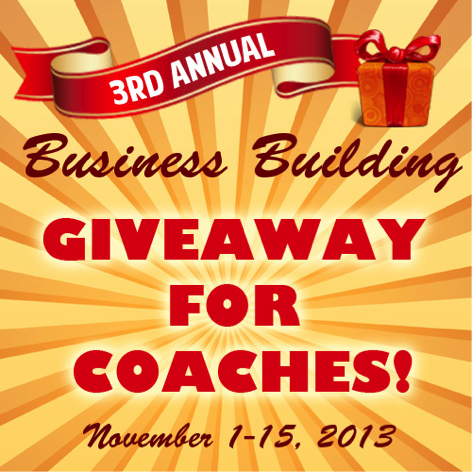 It’s where coaches can “stock up” on valuable business building tools and resources for FREE! My friend and colleague Erika Kalmar created this online event where you can get an incredible assortment of business building resources (worth over $2,000) from some of the top experts in the field for free. These are worth over $2,000, but for a limited time you can get them at no charge. To claim your free gifts, head on over to The Giveaway Page and gain instant access to your goodies! Get your free business building gifts for coaches here. Don’t miss this special opportunity to snag these valuable business building tools and resources created specifically for you. Get your business building gifts now. Enjoy and please post a comment below to let me know which gifts were your favorites!